There is a particular hallway in a hospital I work at… it is just a little bit too long and straight for my comfort. I walk this hallway about 20 or so times a day, with many of the same people who work in the same hospital day after day. And plenty of other people I’ve never seen. This hallway is just long enough to be TOO long when you see someone you know at the other end. It’s too far to try talking to them, so of course in my over-thinking mind… I start to wonder at what point do I make direct eye contact? If I look at someone too soon, and they look at me…are we required to hold eye contact ALL THE WAY down the hallway, until we are close enough to actually say hi? Can I look away? Do I have to smile, and then just….keep smiling???? What if I smile and they don’t? When is it officially close enough to say hi?…. and do I have to stop or can I just keep walking? If you smile too long, your face will freeze like this….. it’s a scary thought. 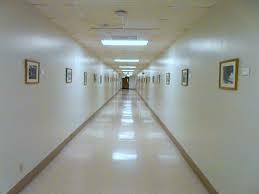 It’s such a long, straight, boring hallway….there really isn’t much to look at. So imagine starting down, and it’s not very crowded yet…. and there is a stranger coming your way. 9 out of 10 times, both of us will do our very best to pretend we don’t see each other. I check my phone (GREAT for ignoring others), I’ll look at my pager, stare intently at the list of patients in my hands…. or remember how much I really adore that painting on the wall-and focus on every brush stroke, or the exit sign up there in the corner…..
WHY do I do that???? Sometimes I look at the people passing me, just to see what they will do. Most don’t look at me. I envy the ones who can just walk and stare straight ahead, looking at NOTHING but doing it so intently, they make nothing seem so important. Sometimes I say Hi, and people sometimes say Hi back to me. I feel victorious when that happens. There are times I see someone I know, way down at the other end. They don’t see me. We don’t make that early eye contact. So I make sure I look really busy, and avoid looking at them at all costs. I imagine we both breathe a sigh of relief as we pretend our way past each other. It’s like these small social opportunities are just too stressful. I’m MUCH friendlier outside of that hallway, honest. I’m not alone, I asked a few friends and they all laughed and admitted to doing the same kind of ignore tactic. I asked my husband and he thinks I’m even crazier than he did before. Is it because he’s not American? Is this isolative behavior more of our cultural norm? If we put that hallway in the middle of, say, Italy…. would people still rush past each other, trying to pretend they are alone? Or would everyone be greeted with a smile, and a kiss on one-or both-cheeks? This entry was posted in humor and tagged ignoring others, meeting people, nervous, social anxiety. Bookmark the permalink.